Now that I've finished reading books for the Cybils Awards Picture Book and Board Book panel (see my post here if you're interested in what I learned), I'm so happy to be back to reading middle grade fiction. This one was published in 2014 and I wonder how I missed it! The idea behind this story is so intriguing. The city of Ark is the last safe place on Earth. To make sure humans are able to survive, everyone in Ark must speak List, a language of only 500 words. Everyone that is, except Letta. As apprentice to the Wordsmith, Letta can read all the words that have ever existed. Forbidden words like freedom, music, and even pineapple tell her about a world she's never known. One day her master disappears and the leaders of Ark tell Letta she is the new Wordsmith and must shorten List to fewer and fewer words. Then Letta meets a teenage boy who somehow knows all the words that have been banned. Letta's faced with a dangerous choice: sit idly by and watch language slowly slip away or follow a stranger on a path to freedom . . . or banishment. 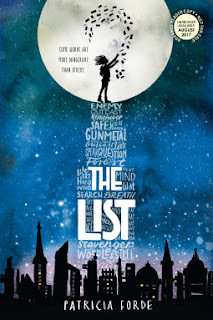 The List by Patricia Forde was published by SourceBooks Jabberwocky in 2014. There are lots of tense moments in this story! I was intrigued by the idea that language is limited and some words were forbidden. I loved the writing style and the detail in this story. You might study this book to see how the author integrated Letta’s thoughts and feelings into the story. The setting is also a big part of this story – I wanted to visit the wordsmith shop and the old pumphouse. There are opportunities for interesting discussions or reflections about censorship and the importance of language in our lives, as well as thoughts about the future and the depletion of resources and water. There is some violence in this novel, including torture and murder, but the descriptions of these events are not overly graphic. I missed this one too when it came out. Thanks for sharing as I've added it to my TBR list. This sounds like such an interesting story with the few words people are allowed. I never even heard of this one. Thanks! What a great premise. I just can't imagine a society's vocabulary being pared down to just 500 words. I'll be on the look-out for this one. That sounds really fascinating. I'm reading Fahrenheit 451 at the moment, and I bet this would be a relevant MG follow-up. Thanks for the review! I haven't read this one, but you had me from the opening. Checking my library now. It reminds me of several other books I've read over the years, including Lowry's The Giver series. I reviewed a PB, Phileas’s Fortune, in 2011 ago about a place where words were made in a factory and people had to buy words.